YOU ARE WRONG BECAUSE YOU WILL SEE TRASH ALL OVER THE PLACE IN YOUR HOUSE WHEN YOU GET HOME FROM WORK! WHEN YOU LEAVE AND YOU THINK I CAN BEHAVE! 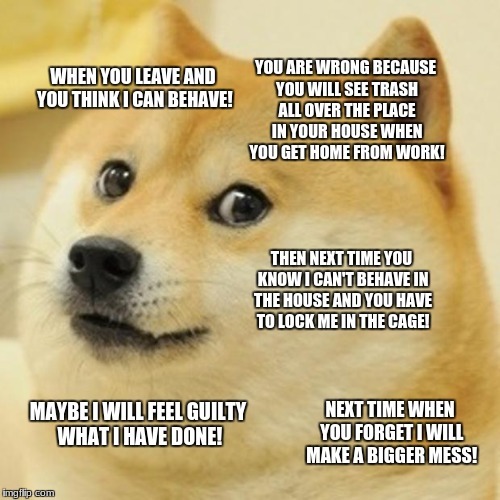 THEN NEXT TIME YOU KNOW I CAN'T BEHAVE IN THE HOUSE AND YOU HAVE TO LOCK ME IN THE CAGE! MAYBE I WILL FEEL GUILTY WHAT I HAVE DONE! NEXT TIME WHEN YOU FORGET I WILL MAKE A BIGGER MESS!